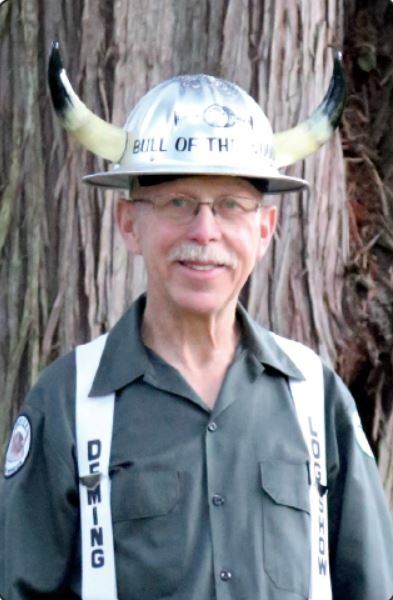 At the February Log Show monthly meeting, Brian was elected the 2016 DLS Bull of the Woods. Brian is very honored to have received this prestigious award. He was born in 1945 to Wayne and Esther Pederson. He has one older brother, Steve. Brian was in the Class of ’63 at Mt Baker High School in Deming. He had his first ride in a log truck at age 13 and knew from that day on his passion was log trucks. In 1964 Brian began driving log truck for Martinson Bros. During the next 4 years he drove for Abner Ludtke, Joe Zender and Harry Scalf, hauling logs in western Washington. In 1965 Brian joined the Army National Guard. He received his basic combat training at Fort Ord CA, his AIT (advanced individual training) was an eleven week welding school at Aberdeen Proving Ground in Maryland. He returned from active duty in July ’66 and continued driving logging truck. In the fall of ’67 Brian bought a welding machine and worked for Martinson Bros. in their shop. The job consisted of fabricating a new log loading boom for their shovel. Upon the completion of the boom Brian worked in a local fabrication shop until September ’68.